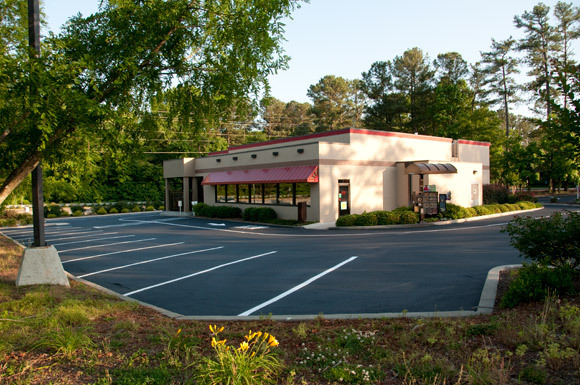 Tim Shirah of Shirah's Painting and Sealcoating has been in the Pavement Maintenance business for over 4 years. During the day he runs his business just like any other contractor, using the light and heat of day to guide the mostly predictable process of sealcoating. However, what makes Tim's business unique - and others like him - is what he does while most of us are soundly sleeping, dreaming about the next day's big job. 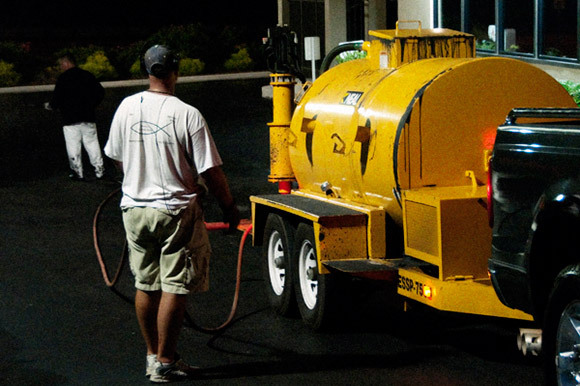 Since early on in Tim's pavement maintenance career, one of his major clients has been a national restaurant chain that requires he do the sealcoating at night. We wanted to share a bit of the process and how Tim feels about his most unusual work hours. I was able to catch up with Tim at one of his night jobs around 10:30 PM just as he was getting started. Because I was normally asleep at this hour I decided to chug down an extra large coffee so I could be sure to take in how this all goes down. 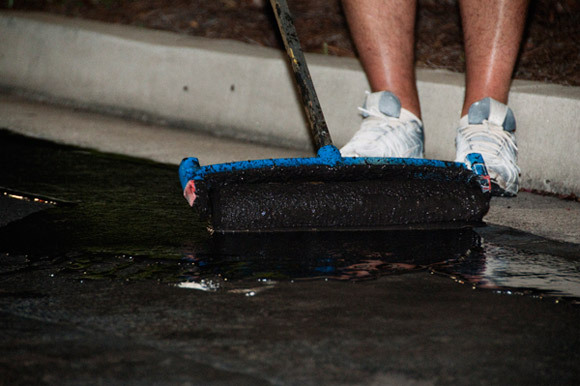 As I adjusted to the surreal nature of smelling freshly churned coal tar sealer at 10:30 at night, I realized quickly that night sealcoating had its advantages. For one thing the temperature was really nice. The obvious downside to sealcoating at night is the lack of light. I asked Tim how he handled the challenge and what he did when there wasn't enough. And, even when you do take all of the right steps things can go wrong. Sure enough, 30 minutes into the job the bustling, well lit parking lot turned to complete darkness. 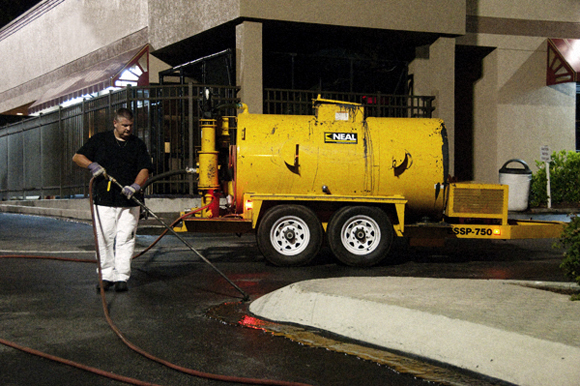 In a matter of seconds the Shirah sealcoating crew went from a super efficient, high speed, sealcoating machine to a dead stop. Thankfully the manager had not left and Tim was able to get them turned back on. Even still, just like those old stadium lights from high school, they took almost 30 minutes to fully illuminate the parking lot. 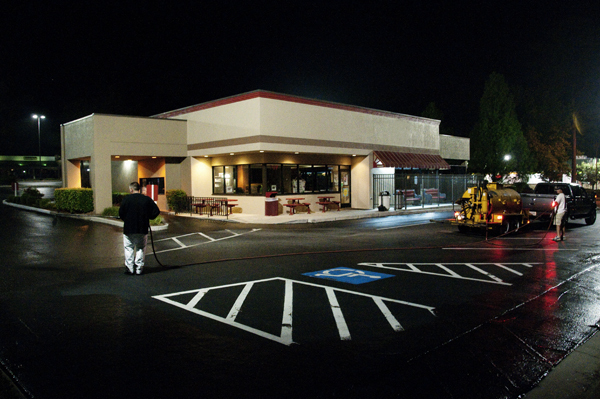 Because of how efficient Tim’s crew is, however, they had the parking lot blown and brushed with the oil spots treated by the time the lights had gone out. They were seriously organized and it was obvious that each person knew exactly what to do. Once the lights were back up they proceeded to edge out the parking lot. They did it the good ol’fashion way. They took the spray tip off the wand and laid a nice puddle of sealer several inches off the curb. One thing that was different than anything I had seen before was how they spread out the sealer. Instead of the typical brushes, Tim’s crew prefers to uses rollers. Within an hour and a half, Shirah Sealcoating had the lot sealed and they were packing up to leave (not even long enough for my coffee to wear off). The parking lot looked amazing, and I was pretty impressed with how efficient they could be at night and still keep sealer off the curbs and landscaping. It was getting late and the next day (this restaurant is closed on Sunday) Tim and crew were coming back to stripe the parking lot. I started packing up my things, but I definitely wanted to come back and see how everything looked in daylight. Needless to say, it was impressive, and especially after they put down those freshly striped white lines. • Get organized! This is true during the day as well, but if you run out of something or have a need at night, chances are you’re out of luck. • Be sure every crew member knows exactly what to do and jumps right on it. Things go best when you hit the ground running. • Make sure you have plenty of light. Remember, be sure to check with the manager before he leaves so the lights don’t go out on you in the middle of the job. • Use good quality materials and equipment. It makes a huge different in both the process and the finished product. • Make sure you allow for plenty of dry time before striping. If you stripe before the sealer is dry it will turn your your beautiful white lines a dingy brownish yellow. If you have any additional night sealing tips, please leave them in the comments below!